What happens when mullet embark on a massive migration along the Florida coast? Eventually, an explosive frenzy ensues, involving sharks, tarpon, and jacks that chase and corral the schooling fish along and even onto the beach, devouring as many as they can in lunging, leaping charges. The accompanying footage, revealing the essence of one of these furious feeding events, was captured earlier this month but began circulating on various fishing-related social media sites this week. Viewers might consider the “Get out of the bait!” portion that begins at 36 seconds to be a highlight, since it involves unsuspecting swimmers who do not seem to be paying attention to the turbulent frenzy advancing upon them. One swimmer is slapped on the back by leaping mullet trying to escape who knows what predator beneath the man and his female companion. 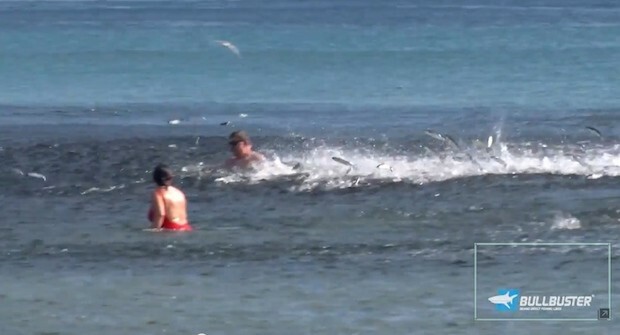 The first shark appears at 14 seconds, and the first tarpon breach is at 28 seconds. 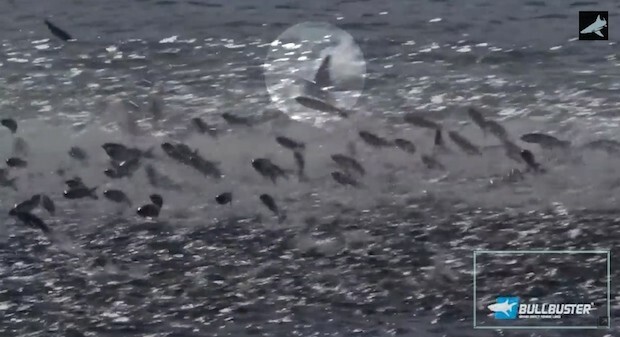 The footage was captured on Florida’s east coast and uploaded by BlacktipH, which states in the description that this type of frenzy occurs every year during the first week of the coastal mullet migration. Looks like a lot of fun… for everyone but the mullet.